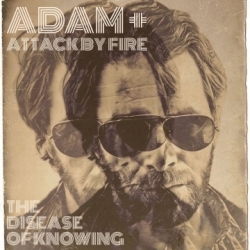 Wake Forest, NC, March 29, 2019 --(PR.com)-- Broken Birdie Productions LLC is proud to announce the release of "The Disease of Knowing" the debut album from Adam + Attack By Fire. "The Disease of Knowing" represents a rollicking rock n' roll re-creation of the peaks and valleys of life, love, and the painful lessons learned somewhere in between. The album, which features eight original tracks, will be available on all major digital music platforms including Spotify, iTunes, and Bandcamp. Adam + Attack By Fire is the creation of Adam Tarsitano (songwriter, lead vocals, rhythm guitar), who wrote all of the tracks on "The Disease of Knowing." The album was recorded and embiggened by veteran rocker Greg Hoy (backup vocals, lead guitar, percussion). According to Adam, "I think it's really an album for fans of rock n' roll who are looking for some substance in their music. But don't get me wrong, it's a lot of fun too."